Happy New Year 2019 from Twin Moons Pottery!!! May your coming year be blessed. During the frigid winter months Twin Moons Pottery is semi-open. My working studio is unheated so I work inside by my cozy woodstove. During the winter I use this time to handbuild many of my creations. I work my unusual face cups and my "Little critters"that so many of my customers love. 2015 was the year of "Howlers and Growlers"here in the studio... Just what is a howler or growler??? 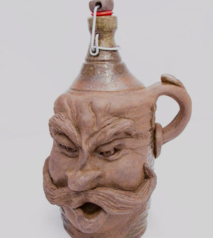 They are jugs or bottles created to carry artisan beer, of course I also envision cider, sangria, or ice tea in them too. A howler holds approx. 32 oz and a growler holds approx. 64 oz. I have created many of them, some with wide growler flip lids, some with smaller flip top lids, and even some with cork stoppers. 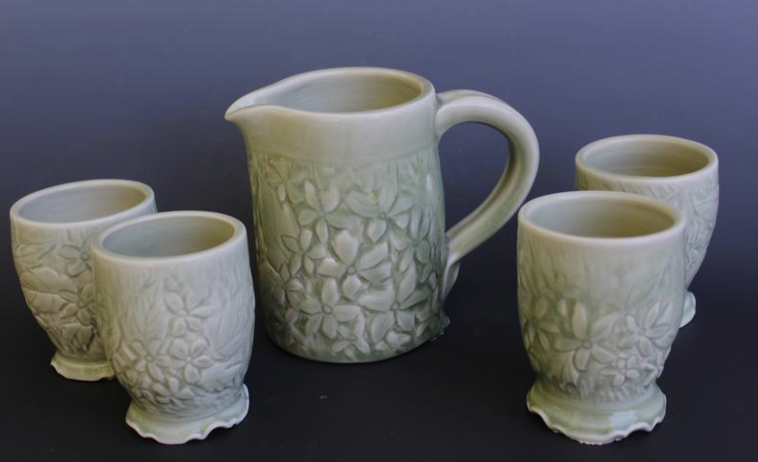 Each jug is uniquely sculptured. I have been sculpting the faces that so fascinate me onto the jugs. I've used a dark clay that has been left "bare naked" and put glaze on the insides and parts of the outside. They will be showing up at festivals and gallery shows in the near future. We have many creations available at our studio for your gift giving needs. Give us a call and we can arrange a time for your shopping. We have some exciting news here at Twin Moons Pottery. Twin Moons Pottery in the "NOMA gallery" in Frederick , Md. "NOMA" "short for North of Market" is located at 437 North Market St. Frederick, Md. The gallery will be open on Friday evenings 4-8:00 and Saturdays 12:00-8:00. "NOMA" has 24 talented artists that are in the gallery. When you come to Frederick, Md. come by and see us at the gallery. "NOMA gallery" participates in Frederick, Md. 's first Saturdays. Our gallery features a new artist each month with a joint co-op show monthly. 1st Saturday of each month. Gallery opening 5:00-9:00 Make sure to mark this on your calendar. Remember Twin Moons Pottery for all your gift giving needs. My pottery is made from Stoneware, and Porcelain clay. Pottery that is high fired to cone 10, (which is around 2350 degrees in a gas kiln) makes a very durable and stable product. My pottery is oven, dishwasher and microwave proof, and we use lead free glazes that are made in my studio. I am proud to say that Twin Moons Pottery is Handmade in America... and that I am living the dream of being the owner of my own small business, where I create beautiful functional, and artistic pottery for your home and daily life rituals. Come by and see us, we would love for you to stop by.